Brandon Elm is a hardy and adaptable tree. 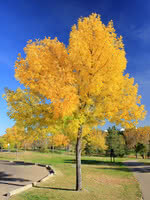 Its dark green foliage turns brilliant gold in the fall. 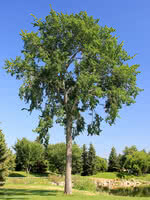 This cultivar of the American Elm is long-lived and fast growing. 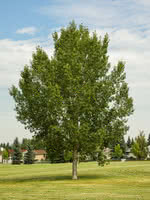 Due to its smaller and more compact form than its cousin, the American Elm, Brandon Elm it is often preferred for home landscapes where it can command the extra money required to propagate it. TreeTime.ca has no plans to produce this tree in the near future.